IADC welcomes the membership of all companies involved in the worldwide upstream petroleum industry that share a commitment to improving safety, advancing drilling technology, striving for reasonable regulation and legislation, and enhancing personnel competence. IADC offers four types of membership. Click on one of the categories below for additional information or to download a membership application form. Contractor – companies who own and operate land or offshore drilling rigs. Producer – companies engaged in exploring for and producing oil, natural gas, or geothermal energy. Associate – service companies, equipment manufacturers, consultants, and academic and/or training institutions. Well Servicing – companies who own and operate well servicing equipment. A complete listing of all IADC Contractor, Producer and Associate members can be found in the IADC Annual Membership Directory. 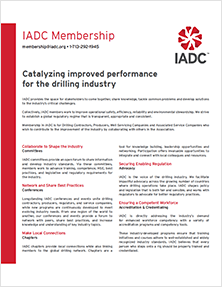 IADC’s Contractor Membership is reserved for contract-drilling firms, whether on land or offshore. Well Servicing members must own and operate only well servicing equipment. Dues depend on the type and capability of the rig fleet, as shown in the tables below. Minimum dues: $800. Maximum dues: $75,000. Dues are shown in U.S. Dollars. IADC’s Producer Membership is open to all energy-producing companies. Dues are based on the size of the company, as determined by overall production rate from most recent prior year (measured in barrels of oil equivalent per day). oilfield-service firms and others with a professional or commercial interest in the upstream energy industry. The dues structure depends on the type and size of the company, as shown in the table below. IADC’s Well Servicing Membership is available to companies who own and operate well servicing equipment. Minimum dues: $800. Maximum dues: $50,000.